After decades as a military and commercial pilot, captain Lee Moak violated an official rule of military life: he volunteered to help with the Air Line Pilots Association, Intl. (ALPA). After tours of duty as a fighter pilot, Moak went to work for Delta Airlines before getting involved with ALPA. In 2005, he was elected leader of the Delta pilot group, and his union involvement soon propelled him from the pilot’s cockpit to a Washington, DC, business office. 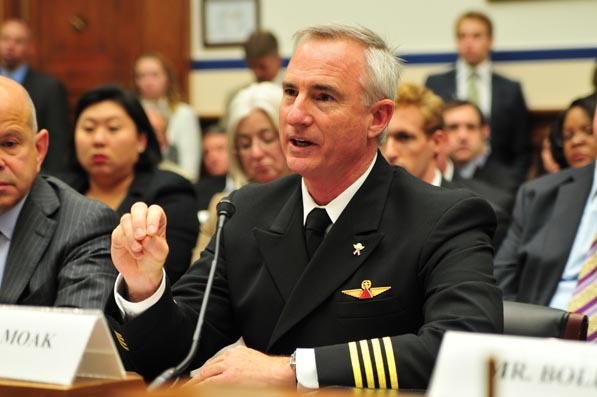 In 2010, he became president of ALPA, and talked with Profile about his experience in Washington. 1. How does ALPA compare to the structure of the Marine Corps? I am most familiar with an organization structured like the military: staff-run and member-supported. I found that the reverse structure works best at ALPA; the staff’s duties are to support the initiatives of members. 2. What is your major focus as ALPA president? We concentrate on three areas. The first is addressing the needs of our members—improving their pay, benefits, and working conditions. Second, interacting with many groups in Washington in order to protect our members’ interests. Finally, maintaining our high safety and security standards. 3. What’s the most demanding part of the job? Interacting with the Washington bureaucracy. Unlike most other industries, air transportation is impacted globally and domestically by many government entities. We have to deal with Congress, the Department of Transportation [DOT], the Federal Aviation Administration [FAA], the Department of Justice [DOJ], the Department of Homeland Security, the Transportation Security Administration, the State Department, the National Transportation Safety Board, the National Mediation Board, and other executive branch agencies. Because we are involved in a complex aviation industry. Some agencies, like the DOT and the FAA, are obvious. But the DOJ oversees airline-merger activities and the State Department gets involved with global competition, open-skies agreements, and so on. We also have to work with Congress, because it can pass influential bills on flight- and duty-time requirements, retirement legislation, and other things. And these bills go to the White House and the Office of Management and Budget, which determines regulatory costs—it never ends. 5. What major obstacles do you face? Did you know there are 17 unique taxes and fees that apply to the airline industry? They were added gradually, mainly because industry executives, labor, and other groups weren’t paying attention to what was happening in Washington, and it was easy for lawmakers to keep tacking on new taxes on an industry that was not strong in defending itself. That needs to change, and we are working to lead that change. 6. What has been your biggest surprise in taking this role? We accomplish our goals at a much slower pace than I expected. In the financial industry, for example, you want to get the job done now. It’s not like that in Washington. Here, interactions are based more on building relationships, and that requires plenty of patience. There are so many things that can happen during the process, even when you think the deal is in place. That’s why we remain persistent and involved in an issue until its completion. 7. You’ve said that corporations should view DC as an investment. Can you elaborate on that? [Corporations] need to have a physical presence in Washington all year, including an office and staff who can deal with the various agencies and government branches. Consider the oil industry, Lockheed, FedEx, and others. They have hundreds of full-time people working in their government-affairs departments. 8. That’s fine for big companies, but what about smaller ones? They might consider pooling their resources to form a coalition, especially if they are in related businesses, and set up an office that works on behalf of all of them. If you’re an executive who’s frustrated with what’s going on in government, you can’t expect other people to devote themselves to your issues; you need to create a proactive approach for change. Some people call this lobbying, I prefer to call it “advocating for your position.” People may not like to work like this, but this is the world in which we have to work. It didn’t take me long to learn how to work in Washington. And on behalf of all ALPA members, I will continue to support their issues every day.